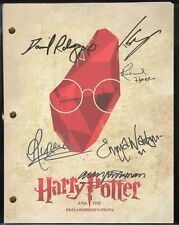 HARRY POTTER and the Philosopher's Stone W/ reproduction signatures "C3"
GAME OF THRONES LTD EDITION REPRODUCTION TELEVISION SCRIPT DISPLAY "C3"
I LOVE LUCY VITAMEATAVEGAMIN LTD EDITION REPRODUCTION TV SCRIPT DISPLAY "C3"
VERY RARE ORIGINAL 1985 LEE MAJORS "THE FALL GUY" SCRIPT USED ON THE TV SHOW! "THE FALL GUY" TV SERIES STARRED: LEE MAJORS, DOUGLAS BARR, AND HEATHER THOMAS. 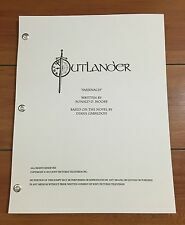 (2) "SETS" PAGES - WHICH LISTS THE "INTERIOR" & "EXTERIOR" AREAS USED TO FILM THE EPISODE, PLUS (61) PAGES OF SCRIPT DIALOGUE USED IN FILMING THE EPISODE. Lisa Kudrow. Courteney Cox. Jennifer Aniston. It has the the signatures of these 8 stars This script has the standard three hole punch with brass fittings and is 38 pages. This is the finale episode and is dated Feb 12,2004. Zustand: ungelesen, wie neu,lichtgeschützt in Folie aufbewahrt. Comic zur TV-Serie "Queer as Folk". Alle Angaben erfolgten nach bestem Wissen und Gewissen. Der Verkauf erfolgt unter Ausschluss der Gewährleistung. Kim Cattrall. Bill Bixby. Jack Colvin. David 'Barton' joins an expedition that has found evidence of a pre-historic Hulk and is recognized by a young doctor who was inspired by him. It has the the signatures of these 3 stars. THIS IS THE ORIGINAL SCRIPT AND DATED FROM 9/23/1966. THE SCRIPT HAS 71 PAGES. THE EPISODE IS "THE HIGH AND THE DEADLY AFFAIR" YOU ALSO GET A HUGH BLUE PRINT OF THE SET. THE SCRIPT IS IN EXCELLENT CONDITION. Bea Arthur. This script has the standard three hole punch with brass fittings and is 56 pages. This is episode #9 and was written by Winfred Hervey. Now you can read along to all of the great lines in this TV show. "UNAIRED PILOT". NICHOLAS BRENDON. BUFFY THE VAMPIRE SLAYER. DANNY STRONG. 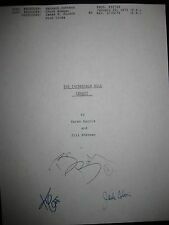 THE COMPLETE SIGNED SCRIPT FOR. THE FINEST LAZER REPRODUCTION SIGNATURES OF CAST. 3 HOLE PUNCH LEFT SIDE, BRASS BRAD CONNECTIONS. "Once More, with Feeling " is the seventh episode of the 6TH Season. It was written and directed by the show's creator, Joss Whedon, and originally aired on UPN in the United States on November 6, 2001. 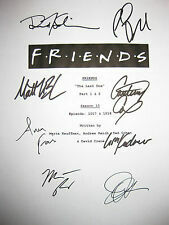 Noah Wyle handsigned the cover of the script. N.W. Ayer & Son, Inc. Jimmy Durante Show #14. Fresh from estate of a woman that worked for NBC in Hollywood in the 1940's. Has been in clean, dry storage. Lakeith Stanfield. Zazie Beetz. Donald Glover. THE OFFICE Show Script "The Carpet"
This is a nice copy of a script from the TV show The Office. This is like the script that they give out to the cast and crew. It is 54 pages long. “Turnabout” 1-2-3-4-5. You select the quantity and the script title. Here is a list of script titles (the numbers after the episode title reflect the quantity available) The scripts range from first drafts to final drafts -- I will send final drafts first unless you specify a type of draft you want. CHARLIE HUNNAM KIM COATES. KATEY SAGAL TOMMY FLANAGAN. SONS OF ANARCHY. 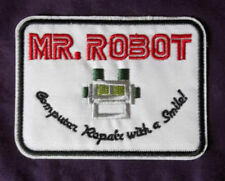 THE COMPLETE SCRIPT FOR. ALL SCRIPTS INDUSTRY STANDARD, 8 1/2" X 11" PAPER. YOU ARE CONSIDERING A COLOR REPRODUCTION OF. You select the quantity and the script title. Here is a list of script titles (the numbers after the episode title reflect the quantity available) The scripts range from first drafts to final drafts -- I will send final drafts first unless you specify a type of draft you want. Charlie Hunnam. Katey Sagal. Ron Perlman. This script has the standard three hole punch with brass fittings and is 53 pages. This script is the entire revised pilot from 6/10/08. This script also contains the cast list along with the interiors and exteriors. Alexis Bledel. Joseph Fiennes. Elisabeth Moss. This writer's draft pilot script from 11-29-15 has 49 pages and has all the lines from this blockbuster show. Charlie Hunnam "Jax". It has the signatures of these 7 stars Ron Perlman "Clay". This script has the standard three hole punch with brass fittings and is 38 pages. This script is the entire Production Draft from Oct. 15, 2008. This is a nice script from the TV show The X-Files. This is the script that they give out to the cast and crew. MacGyver Television Script: Nov. 5, 1985; "Target MacGyver"
November 5, 1985 2nd revised script; 54 pp. "Target MacGyver.". Kerry Bishe. Scoot McNairy. It has the signatures of these 8 stars This script has the standard three hole punch with brass fittings and is 63 pages. Now you can read along to all of the great lines in this TV show. The script is clean and in fantastic condition. John Krasinski. Steve Carell. It has the signatures of these 14 stars Now you can read along to all of the great lines in this TV show. Be one of the few to own such a epic script that will certainly go down in history. Dynasty Final Draft Script 6/28/1984. Original Production Script 46 Pages. Title: "The Trial". Avoid Issues: REVIEW THIS ITEM CAREFULLY BEFORE BUYING. Avoid Issues: REVIEW THE ITEM CAREFULLY BEFORE BUYING. Nina Dobrev. It has the the signatures of these 11 stars Paul Wesley. This script has the standard three hole punch with brass fittings and is 62 pages. This revised network draft script from February 4, 2009 is the first episode of this hit series. 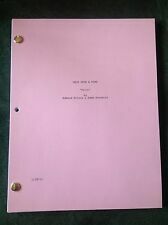 BEVERLY HILLS 90210 show script "The Leprechaun"
This is a nice script from the TV show Beverly Hills, 90210. This is the script that they give out to the cast and crew. THIS IS THE ORIGINAL SCRIPT USED ON THE SET. THE EPISODE IS "SHADOWS OF R' JEM" THE SCRIPT IS IN EXCELLENT CONDITION. This is a great script and a great show starring Nathan Fillion. It is 54 pages long. Starting over isn't easy, especially for small-town guy John Nolan who, after a life-altering incident, is pursuing his dream of being an LAPD officer. 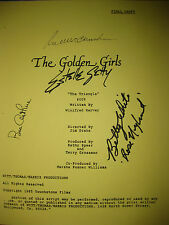 THE GOLDEN GIRLS script "A Little Romance"
This is a nice script from the TV show The Golden Girls. This is the script that they give out to the cast and crew. DISPLAY CASE ideal for a signed TV script. Clear Base. Our Patented Display Case will allow you to show off your prize collectible Script. The tapered cover draws the eye to the Script while the raised black base displays the script for optimum viewing. Don Knotts. Joyce Dewitt. John Ritter. Pricilla Barnes. JENNIFER ANISTON. THE LAST ONE - FINALE. The following Script and Signatures are. LISA KUDROW. With her best friend Simon in tow, Clary must now live among faries, warlocks, vampires and werewolves to find answers that could help her find her mother. Katherine McNamara. Dominic Sherwood. Professionally bound with a standard three hole punch and brass fittings. PAUL GROSS, DAVID MARCIANO, BEAU STARR. SCRIPTS ARE REPRINTED ONTO 8 1/2" X 11" WHITE PAPER. PREPRINTED AUTOGRAPHS ON COVER;. 3 HOLE PUNCH, FASTENED WITH BRADS. BUFFY THE VAMPIRE SLAYER BY JOSS WHEDON 1990 TV SHOW SCRIPT LUKE PERRY "PIKE"
Script is by Joss Whedon dated April 1, 1990. Up for sale is this pre-owned Buffy The Vampire Slayer 1990 TV Script. This script features "Pike" Luke Perry's Character. Digital photographs are taken. In the Capwell residence, a reception is being held in honor of (closeted gay) Channing Jr, one of the off-spring of powerful C.C. Five years later, July 30th, 1984, Joe Perkins is released from prison (for the murder of) Channing Jr. for good behavior. The lead character, Archie Bunker, is a loudmouthed, uneducated bigot who believes in every stereotype he has ever heard. His wife, Edith, is sweet but not the sharpest knife in the drawer. 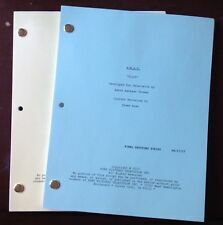 Very Rare Original ALL IN THE FAMILY Production Used Script from Season 6 Episode 9. HUGH LAURIE. The following Script and Signatures are. SIGNED BY 7 REPRINTS from Original. OLIVIA WILDE. JESSE SPENCER. DAVE COULIER. JOHN STAMOS. LORI LOUGHLIN. YOU WILL BE GETTING A WATERED DOWN, MORE PIXELATED COPY FROM THEM. I OWN THE ORIGINAL SIGNED SCRIPT/COVER. The following Script and Signatures are. FULL HOUSE. John Charles Walters Productions in Association with Paramount Pictures Corporation. The episode was "Elaine and the Monk, " 60275-099. It is also signed "1983, A Pleasure, Judd Hirsch.". Aaron Sorkin. Allison Janney. Professionally bound with a standard three hole punch and brass fittings. This final draft script from February 6, 1998 has 59 pages. No rights are given or implied since this is sold from collector to collector. Lisa Kudrow. Courteney Cox. Jennifer Aniston. This script has the standard three hole punch with brass fittings and is 60 pages. This is the 1st draft pilot episode and is dated March 3, 1994. Now you can read along to all of the great lines in this TV show. Ron Ely as TV's TARZAN 1968 ORIGINAL RELEASE DIALOG & CUTTING CONTINUITY SCRIPT! Co-starring Barbara Bouchet. This is NOT A REPRODUCTION. S.W.A.T TV Script Pilot Episode 4/17/17 Shemar Moore, NEW, Great keepsake. AIRWOLF (1985) ORIG. TV SCRIPT "SEVERENCE PAY" JAN-MICHAEL VINCENT ~ VF/XF! PEE-WEE'S PLAYHOUSE (1988) ORIG. TV SCRIPT "TO TELL THE TOOTH" ~ VF/XF!